First a quick explanation of a MoviePush movie marketing reviews. Not quite a traditional review of a film, this is an opinion of whether the marketing successfully (and honestly) conveyed what audiences could expect from the film. In other word, did the film deliver on its “marketing promise”. 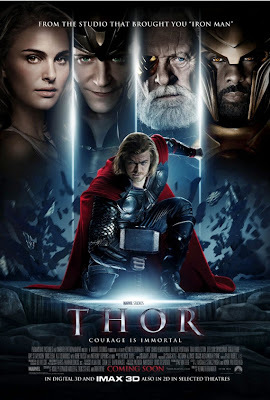 Straight from the start I’m going to say I really enjoyed Thor, it’s a great introduction to the character and I especially liked the way it tells an origin story in a completely different way than we’re use to seeing. There are some great action sequences and some amazing special effects most of which has not been included in the advertising! ﻿Chris Hemsworth is perfect as Thor and I’d say he’s as good as Robert Downey Jr is at playing Tony Stark/Iron Man. The other acting is solid, but Hemsworth is clearly the standout. My only criticisms revolve around the Earth section, for several reasons... Firstly this section takes on a different tone to the Asgardian scenes (with the forced humour seen in the trailers), the look of the film changes (looking a lot cheaper) and a lot of the SHEILD stuff is redundant to this narrative but obviously is all set-up for The Avengers (though nowhere near as bad as in Iron Man 2). The above is minor and I still really enjoyed the film overall. Personally, I think the marketing has let Thor down. Don’t get me wrong most of the posters are pretty cool, but the trailers have predominantly focused on the Earth section of the film and this is the worst part of the film. All the best stuff (and probably where most of the budget was spent) happens in Asgard. Visually everything here looks so much richer, the costumes never look out of place, there is no forced humour and the action feels that much more intense. After the first 20-30 minutes (all on Asgard) I was blown away, the whole first act is epic in scale and I was wondering why they didn’t cut a trailer from the shots/scenes in this act alone. It would be incredible and Marvel would probably attract a lot of the Lord of the Rings crowd if they had.